Apple iPad is the tablet computer from Apple that has generated lots of interest because of its potential as a game changer. 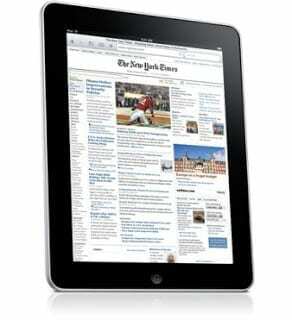 The Apple iPad will find application in computing, mobile gaming, e-reading, and multimedia. You can do a lot with the iPad, but there are a few things that the iPad can’t do like multi-tasking, take photos: iPad lacks a built-in camera, and printing. Aside these, the Apple iPad is a cool looking gadget with a potential of setting new standards in the digital media industry. The second generation iPad is now available in the United States and will soon be available in other countries. Apple iPad 2 features two cameras with FaceTime, a 1GHz dual-core processor, and Gyroscope. Apple iPad is essentially a big iPod Touch. However, the large size means it can be good at other applications that iPod Touch still struggles with today. Like the Amazon Kindle DX, Apple iPad has a 9.7-inch display, however Apple iPad is fatter at 0.5-inch and heavier at 1.5 pounds. Apple iPad features an LED-backlit widescreen Multi-Touch colour display, making it great for your videos, maps, and for surfing the web. e-books, newpapers, and magazines will also benefit from the colour display, offering a rich and glossy look. Apple iPad features a resolution of 1024 x 768 with a pixel density of 132 ppi, and makes great view whether in portrait or landscape. Apple iPad will be available in two main models: a Wi-Fi only model and a WiFi + 3G model. Both models come with either 16GB, 32GB, or 64 GB storage and run on a 1 GHz processor. iPad will offer up to 10 hours battery life, although it is not clear in what applications. No doubt Apple iPad will be a multi-purpose gadget having relevance as an e-reader, a gaming platform, a netbook/tablet, a media player, in printing/scanning, in maps/navigation, and so on. iPad as an e-reader has generated lots of buzz, especially with 2010 being seen as the year of e-readers. A number of tech enthusiasts have predicted the demise of the Amazon Kindle because of the multi-purpose capability of the iPad and its ability of delivering contents in brilliant colours, but that remains to be seen especially when you factor in Kindle’s lower purchase and maintenance cost and the e-ink factor. Kindle is a dedicated e-reader, while Apple iPad is a multi-purpose device. For example most mobile phones now come with built-in camera, but that has not led to the demise of dedicated cameras. So, there will market for both the Kindle and the Apple iPad. Apple also announced the iBooks App for the iPad, which will enable users buy e-books at the iBook store. 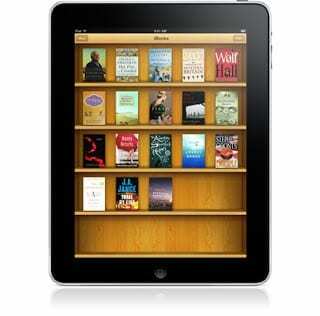 Downloaded e-books are arranged brilliantly in a book shelf, making them easier to access in just a tap. With a brilliant colour screen, Apple iPad will display books in brilliant colours, which can make reading with it a pleasure. iPad will be great for your newspapers, glossy magazines, maps, and even your Biology textbook. Any colour rich e-book will deliver better on iPad. As stated earlier Apple iPad is a big iPod Touch, so expect great media and mobile gaming capability that the iPod Touch is well known for. Watch HD Videos and TV shows directly on iPad as well as with a YouTube App. An iPod App is provided to give you the same music experience you get from the iPod. iPad can also sync with content you already have in iTunes on your computer, saving you time and money. You can arrange your iPad home page to suit you. Placing your favorite apps on your home page gives you one touch access to your favourite apps and websites. There are lots of Apps to choose from, for a start Apple guarantees that more than 140,000 iPhone Apps will also run on iPad. However, Apple already has thousands of apps for the iPad available for download. Apple iPad offers Wi-Fi 802.11 a/b/g/n for accessing the internet, email and downloading your content. The Wi-Fi + 3G model offers HSDPA with UMTS and GSM/EDGE on 2G networks. Apple iPad supports navigation; the Wi-Fi only model lacks GPS, but uses Wi-Fi to track your location. 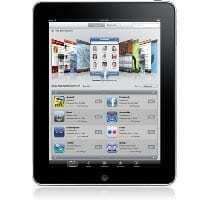 Apple iPad Wi-Fi + 3G models come with GPS navigation as well as cellular navigation. Apple iPad uses Google maps to deliver good street level satellite image/map to enable you find your way around easily when in an unfamiliar environment. Points of interest like restaurants, banks, etc can found just with a tap. Both Apple iPad models feature digital compass.